One of the questions we see being asked time and time again on internet forums, by email and on facebook is “how do I get cheap shared ski transfers from Geneva airport?”. If you’re travelling in a small group or on your own then paying for a private taxi transfer from Geneva airport up to the ski resort may not be an option. By sharing a transfer with other skiers & snowboarders going in the same direction though, the price becomes much more manageable. Unfortunately, sometimes finding a suitable shared transfer can feel overly-complicated. Snowcompare is here to help with that though as we’re building partnerships with the best shared transfer providers and putting them together on one easy-to-use website. Geneva airport is one of the busiest airports in Europe during the summer months with thousands of skiers and snowboarders looking for onward transport. It makes sense for us to start here and look at shared transfers going towards the Tarentaise Valley and some of France’s biggest and best ski resorts. One important thing to note before we start – there are two different types of shared transfers; Scheduled journeys and Ad-hoc journeys. Scheduled journeys are timetabled shared transfers with set times for pick-ups and drop-offs. Ad-hoc journeys are put on by private transfer companies when they have an empty journey to fill. They’ll tell you what time they need to be at the airport, or what time they’re leaving the airport, but everything else will be up to who books on that day. 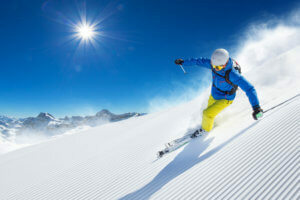 Simply Transfers are one of our larger partners that organise shared ski transfers from Geneva airport. They put on multiple scheduled transfers through the winter season heading to French ski resorts. Simply Transfers tend to run large coaches, but they also have minibuses and will use whichever vehicle is appropriate for the journey. 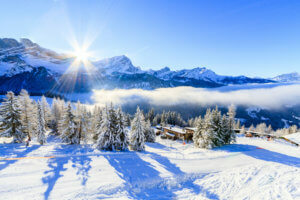 Simply Transfers run a full timetable of shared ski transfers from Geneva airport to the ski resorts of Meribel, Courchevel, Val Thorens, Val d’Isere, Tignes, Les Arcs, La Plagne, St Martin de Belleville & Les Menuires. Pick-up and drop-off points are centrally located in each resort to be as convenient as possible. They operate up to 8 coaches on Saturdays, up to 6 on Sundays, plus additional shared ski transfers from Geneva airport on Wednesdays and Fridays. Shared transfer buses are guaranteed to run and cost just 58€ per person one-way and 99€ per person return. 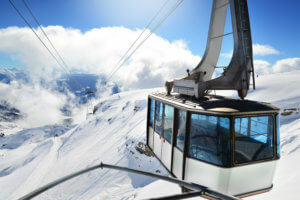 Three Vallee Transfers have been providing private transfers for years, but two seasons ago saw a gap in the market for cheap shared transfers between Geneva airport and Meribel, Mottaret & Courchevel. They now provide a timetabled shared transfer service in addition to their own taxis. A major benefit of Three Vallee Transfers is that they will pick you up and drop you off at your hotel door so you don’t have to struggle with luggage in the snow. Their low-cost shared transfer service operates in 8 seat minibuses so you get a comfortable journey with minimal delays but at the price of just 65€ per person one-way. Up to 5 shared ski transfers from Geneva airport run every day of the week during the winter season and represent an economic but comfortable way to get from Geneva to Meribel, Mottaret or Courchevel ski resorts. Much like Three Vallee Transfers, Mountain Rides normally provide private transfers from Geneva to their home resort of Tignes. They have worked with Snowcompare since we first started and our customers have always been happy with the service they provide. This season though they have decided to offer cheap shared transfers for skiers travelling between Geneva airport and Tignes or Val d’Isere. Mountain Rides shared transfers will be run on an ad-hoc basis, so where they already have a booking and can provide low-cost travel on the empty leg of that journey. The transfers will pick-up and drop-off at individual chalets, and will be in their comfortable 8-seat minibuses with no additional stops once you get on the road to Geneva. Mountain Rides shared transfers cost 75€ per person for a one-way journey. We’ll be adding more shared transfer partners working in ski resorts all over Europe very shortly. For now though if you are travelling to or from Geneva airport and are looking for a shared transfer then the easiest way to see who is available is to enter your journey details on Snowcompare.com. Simply select the Shared Transfers option at the top of the results page and we’ll show you exactly who is available to be booked directly through the website.